Irish and international talent from the worlds of film and television came together for the IFTA awards this evening. A STELLAR LINE-UP of Irish and international creative talent from the worlds of film and television came together on Saturday in Dublin for the 10th Annual Irish Film & Television Awards. The Irish Film & Television Awards was hosted by Simon Delaney for his third successive year, and honoured the finest work from Ireland’s top actors, directors, writers and film makers. Guests this evening included John C Reilly, Saoirse Ronan, Jim Sheridan, Chris O’Dowd, Victoria Smurfit, James Nesbitt, Fionnula Flanagan, Michelle Keegan, Chris Fountain, Whitney Able, Kian Egan, The Hardy Bucks and Jamie Dornan. Irish crime-drama Love/Hate took home six awards, including IFTAs for Best Drama, Best Director David Caffrey and Writer TV Stuart Carolan. Love/Hate actors Tom Vaughan-Lawlor, Charlie Murphy and Susan Loughnane received IFTAs for Actor Lead TV Drama, Actress Lead TV and Actress Support TV Drama, respectively. In the film categories, What Richard Did picked up five awards throughout the night including the award for Best Film. Jack Reynor won the award for Actor Lead Film whilst Lenny Abrahamson and Malcolm Campbell received IFTAs for Best Director and Script with their fifth IFTA going to Nathan Nugent for Editing Film. Actor Support TV went to Andrew Scott for his role in Sherlock. Anna Karenina and Shadow Dancer star Domhnall Gleeson was presented with the Actor Support Film award for his performance in Anna Karenina. Actress Ruth Bradley won for her Lead performance in monster movie Grabbers, while Brid Brennan won the IFTA for her Supporting Actress role in the drama Shadow Dancer. The Irish Film Board Rising Star Award on the night went to Gerard Barrett who was the writer, director, editor and producer for feature film Pilgrim Hill. When Ali Came to Ireland (True Films) by Ross Whitaker and Aideen O’Sullivan took the IFTA for Best Sport. Argo won the IFTA for Best International Film, Daniel Day-Lewis was voted Best International Actor for Lincoln, and Marion Cotillard for Best International Actress for her role in Rust and Bone. Northern Irish cinematographer Seamus McGarvey won the Director Of Photography of Film award for his second year in a row, this year for his work on Anna Karenina. Maggie Donnelly took home the Costume IFTA for her designs in Good Vibrations while Garret Farrell, Hugh Fox and Steve Fanagan won the IFTA for Sound Film/ Drama in Citadel. TV series Ripper Street picked up two awards on the night: Sharon Doyle for Make Up and Mark Geraghty for Production Design. Brenda Morrissey won the TV Editing award for Inside the Department, Michael O’Donovan, Gaeil Nua Eabhrac was presented the IFTA for Director of Photography Television and the Sound TV award went to Mark Henry, Conall de Cleir, John Brennan for Am An Ghathair and the award for Original Score going to Niall Byrne, Loving Miss Hatto. In the factual categories, The George Morrison Feature Documentary Award was presented to Mea Maxima Culpa: Silence in the House of God; TV Documentary was won by Congo 1961; Best Factual Programme went to The Radharc Squad, and Spotlight: Sean Quinn’s Missing Millions received won the Current Affairs category. 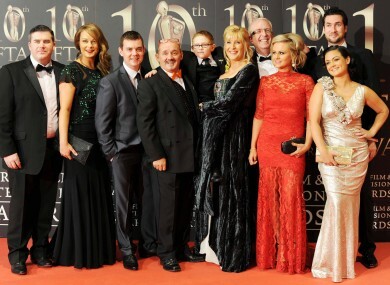 Email “Creative talent gathers in Dublin for the 10th Annual Irish Film & Television Awards”. Feedback on “Creative talent gathers in Dublin for the 10th Annual Irish Film & Television Awards”.